We want to know how the public think decisions about public services in Cornwall should be made in the future. Who decides: How your money is spent? 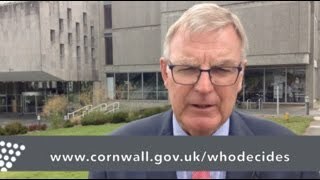 If we have a Mayor for Cornwall? Is the current Cabinet and Leader system the best way for Cornwall to be governed? Do you want to keep things as they are or change to the older Committee style Council, or would you prefer a Mayor for Cornwall? We want to hear your views at a series of public events across Cornwall. Cornwall Council is looking at how the Council currently operates and makes decisions about the services we provide. The Councils review, known as the 'Governance Review' being led by the Council's Constitution and Governance Committee that will make recommendations to the Council. An independent external panel, will also gather evidence for the committee to consider. The Council could also develop a model that sits outside the Cabinet, Mayor or Committee system; this would require Government approval. Any changes to the current system will be introduced, to coincide with the local elections, in May 2021. More information about the review and how the public can give their views is available on Cornwall Council's website. Cornwall Council currently has 123 Councillors or Members and a Leader and Cabinet system. They are also responsible for implementing the agreed policies of the Council. Elected Mayor system A Mayor system is similar to a Leader and Cabinet system but a Mayor is directly elected by local residents and is not a Councillor. The Mayor holds office for four years and cannot be removed by the Council. Each year the Elected Mayor presents a budget and major policies to the Council, which can be approved by a simple majority; however any changes proposed by the Council must have the support of at least two thirds of the Council. Committee system: Under the Committee system decisions are taken by committees comprising Members from all political groups, according to the proportion of the elected Council.